Played five seasons for Los Naranjas de Villa Clara in Cuba's Serie Nacional (2008-12)...started his pro career when he was 17 years old...was teammates with Leonys Martin and Dayan Viciedo...Represented Cuba in various international tournaments, including the 2010 World University Championship Games in Tokyo...Signed a four-year contract as a free agent with St. Louis on March 11, 2014. Set career-highs in games (130) and home runs (18) in his first season with the Blue Jays...batted .263 (111x422) with 26 doubles, 55 RBI and a .756 OPS (.303 OBP/.453 SLG)...following the All-Star Break, batted .290 (56x193) with 15 doubles, 10 homers and 32 RBI...made his second-career Opening Day roster...was placed on the 10-day DL with a left ankle sprain on May 7...activated on June 1...was traded to the Astros on Nov. 16 in exchange for RHP Trent Thornton...homered in back-to-back games for the first time in his career from April 2-3...hit a game-tying three-run homer on April 13 at CLE, marking the second time in his career that he homered in consecutive games...drove in his 100th career RBI on a walkoff hit on June 7 vs. BAL, a 10th-inning single...was his second-career walkoff hit...recorded his third-career walkoff hit on July 20 vs. BAL, an RBIsingle...hit his 17th homer of the season on Sept. 5 vs. TB, driving in Kendrys Morales and Lourdes Gurriel Jr... marked the sixth time in MLB history that a player homered to score three Cuban-born players...tied a careerhigh with three doubles on Sept. 8 vs. CLE, matching his season-high with four hits...set a new career-high in home runs with his 18th shot of the season on Sept. 17 at BAL. Had 24 of his 74 hits go for extra-bases (17-2B, 7-HR) ... Collected 19 infield hits to lead the Cardinals ... Hit .625 (5-for-8) as a pinch hitter with a double and a home run ... Stole two bases on April 2 vs. CHC for the 1st multi-steal effort of his career ... Homered twice for his 1st multi-HR game on April 8, 2017 vs. CIN...Went 3-for-5 and matched a career high with four RBI (also Sept. 27, 2016 vs. CIN) ... Hit his 2nd career pinch-hit home run on April 22 at MIL (also April 8, 2016 at ATL) ... Stole his 4th base of the season in his 31st game on May 10 at MIA, matching his total from 2016 (111 games) ... Put together a career-best eight-game hitting streak from May 20-29 (.323, 10-for-31, 6-2B) ... Doubled in five consecutive games from May 21-27 (6-2B) ... Had a team-high 30 hits and eight doubles in May (.294 AVG, 1HR, 7RBI, 8BB/19K) ... Sent to the minors on June 28...Was tied for the team lead in hits at the time (.260 AVG, 71H) ... Was recalled again on Sept. 20 after hitting .253 in 46 games for Triple-A Memphis ... Went 3-for-13 (.231) with a double in his final eight games as a Cardinal. Recalled by St. Louis on 4/4 following an injury to Tommy Pham and joined the team for the second game of the season...Was selected to the All-Star Game as an injury replacement for Matt Carpenter. Became the first Cardinals rookie All-Star since Albert Pujols (2001). Struck out in his lone at-bat in the 8th inning against Will Harris (HOU)...Finished 5th in the National League Rookie of the Year voting...Ranked among MLB rookie leaders in HR (17, T7th), RBI (65, 3rd), runs (71, 2nd), hits (121, 5th), doubles (28, T3rd), extra base hits (48, T3rd) & walks (41, 5th)...Ranked 3rd on the Cardinals with 36 multi-hit games...Was 3-for-4 with a home run and two walks in pinch-hitting situations. Hit a pinch-hit home run in his second MLB game at ATL (4/8), his second MLB hit...Ranked 7th in the National League with a .266 BA on two-strike counts...Led the Cardinals with 16 defensive gems...Led all MLB rookies with six intentional walks, most by a Cardinals rookie since Pete Kozma (8, 2013) and most by an MLB rookie since Michael A. Taylor (9, 2015)...Ranked 10th in NL batting (.312) at time of injury and his 25 doubles were leading STL & T8th in N.L...Became the 2nd Cardinals rookie and first since Albert Pujols (2001) with 30 hits in April...Had hits in seven straight plate appearances 4/22-24 at SD including going 5-for-5 at SD on 4/23. He was the first Cardinals rookie with five hits in a game since Wally Moon (5-6, 5/12/1954) and first with eight hits in consecutive games since Bake McBride (1974)...Tallied a pair of seven-game hit streaks: the first from 4/20-27, in which he batted .577 (15-26) with runs scored in five straight games & also 7/5-15...Was part of two back-to-back home runs 4/24 at SD and 5/2 vs. PHI...Batted lead-off for the first time vs. PHI on 5/4 and hit a two-RBI single. Hit a 3-run HR (#10) at SEA on 6/24 to become the 9th STL rookie (1st shortstop) with 10 HR before his 70th career game...Hit three doubles at SEA on 6/26, becoming the first Cardinals player to do so since Pete Kozma (5/26/13 at LAD)...Reached base safely in 26 straight games 6/19-7/23, the longest streak by a Cardinals player in 2016...Recorded 11 assists vs. MIL (7/1), the 2nd-most by any MLB player in 2016 (Chase Utley, LAD, 13) and the most by a Cardinals rookie since Stu Martin (11 at 2nd base, 6/6/1936 vs. NYG) and most since Delino DeShields (11 at 2nd base, 8/12/1998 vs. NYM)...Hit first career walk-off GW-RBI single in the 9th vs. SD on 7/21...Missed 36 games from 8/1-9/10 on the 15-day disabled list with a fractured right thumb following a hit by pitch by Marlins pitcher Andrew Cashner (7/31) at MIA. Spent rehabilitation assignments at Gulf Coast, Palm Beach and Springfield. • Hit a game-tying two-run HR vs. CHI on 9/13, his 1st start off the D.L...Hit first career grand slam on 9/27 vs. CIN off Robert Stephenson for the eventual game-winning RBI. Split his season between Springfield (AA) and Memphis (AAA)…Began the year at Springfield where he played 91 games at shortstop (89 starts) and hit a team-high 25 doubles…Hit lefties at a .383 clip at Springfield with 6 of his 10 home runs and 22 of his RBI (vs. .216, 4 HR, 24 RBI against right handers)…Was batting .373 (25-67) in 18 August games with half of his home runs coming in the month prior to his promotion to Triple-A. ..Named the Cardinals Minor League Player of the Month for August after batting .359 (33-92) with 6 home runs and 19 RBI over 25 games between the two affiliates. ..Was named the Texas League Player of the Week for 8/10-16 after batting .435 (10-23) in five games during that week. That stretch came in the midst of a season-matching high 8-game hitting streak (14-33, .424) and with hits in 16 of 17 games from 7/30-8/19 (26-67, .388)…Promoted to Memphis on 8/23 (Greg Garcia recalled to St. Louis) where he started the final 14 games of the season at short…Hit .424 (14-33) against right handers and .400 (10-25) when batting with runners on…Played in 20 games at shortstop for Surprise in the Arizona Fall League, batting .315 (10th AFL) with a team-high 8 doubles, 4HRs and 14 RBI. Signed during Spring Training and received an invitation to Major League camp...Played in two Spring Training games and batted .600 (3-5)...played in 47 games between Springfield (AA) and Palm Beach (A) alternating between shortstop and designated hitter...Began the season in Springfield (AA) and played in 20 games batting .307 before landing on the disabled list with a right shoulder injury...Returned to action June 12 and played in 14 more games before being sent down to Palm Beach (A)...Batted .227 at Palm Beach in 14 games as a designated hitter and one game playing third base in the final game of the season...Batted .273 with 5 HR and 24 RBI combined...hit his first minor league home run in the top of the 14th inning at San Antonio (4/10) off Matt Branham, as part of a 4-for-7 game with 3 RBI...Was part of back-to-back four hit games missing the cycle by a home run the first game and triple in the next...Batted .313 (10-26) with runners in scoring position at Springfield....Hit an outstanding .438 (21-48) with a HR and 9 RBI in the 7th inning or later over the course of the season (.583 slugging pct.). 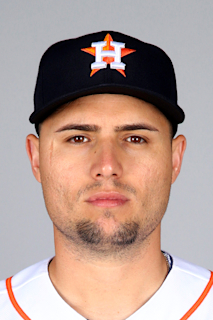 November 17, 2018 Houston Astros traded RHP Trent Thornton to Toronto Blue Jays for SS Aledmys Diaz. June 1, 2018 Toronto Blue Jays activated SS Aledmys Diaz from the 10-day disabled list. May 29, 2018 Toronto Blue Jays sent SS Aledmys Diaz on a rehab assignment to New Hampshire Fisher Cats. December 1, 2017 St. Louis Cardinals traded SS Aledmys Diaz to Toronto Blue Jays for CF J.B. Woodman. September 20, 2017 St. Louis Cardinals recalled SS Aledmys Diaz from Memphis Redbirds. June 28, 2017 St. Louis Cardinals optioned SS Aledmys Diaz to Memphis Redbirds. September 11, 2016 Aledmys Diaz roster status changed by St. Louis Cardinals. September 7, 2016 St. Louis Cardinals sent SS Aledmys Diaz on a rehab assignment to Springfield Cardinals. September 3, 2016 St. Louis Cardinals sent SS Aledmys Diaz on a rehab assignment to Palm Beach Cardinals. August 2, 2016 St. Louis Cardinals placed SS Aledmys Diaz on the 15-day disabled list retroactive to August 1, 2016. Right thumb fracture. April 5, 2016 St. Louis Cardinals recalled SS Aledmys Diaz from Memphis Redbirds. March 20, 2016 St. Louis Cardinals optioned SS Aledmys Diaz to Memphis Redbirds. November 19, 2015 St. Louis Cardinals selected the contract of Aledmys Diaz from Memphis Redbirds. August 23, 2015 SS Aledmys Diaz assigned to Memphis Redbirds from Springfield Cardinals. July 10, 2015 St. Louis Cardinals sent SS Aledmys Diaz outright to Springfield Cardinals. July 10, 2015 SS Aledmys Diaz assigned to Springfield Cardinals. July 8, 2015 St. Louis Cardinals designated SS Aledmys Diaz for assignment. April 23, 2015 Springfield Cardinals activated SS Aledmys Diaz from the 7-day disabled list. April 20, 2015 Springfield Cardinals placed SS Aledmys Diaz on the 7-day disabled list. April 3, 2015 SS Aledmys Diaz assigned to Springfield Cardinals from Memphis Redbirds. March 23, 2015 St. Louis Cardinals optioned SS Aledmys Diaz to Memphis Redbirds. October 17, 2014 Aledmys Diaz roster status changed by St. Louis Cardinals. September 29, 2014 St. Louis Cardinals recalled Aledmys Diaz from Palm Beach Cardinals. September 12, 2014 Palm Beach Cardinals activated SS Aledmys Diaz from the 7-day disabled list. August 22, 2014 Palm Beach Cardinals placed SS Aledmys Diaz on the 7-day disabled list. August 6, 2014 SS Aledmys Diaz assigned to Palm Beach Cardinals from Springfield Cardinals. July 2, 2014 Springfield Cardinals placed SS Aledmys Diaz on the 7-day disabled list. June 12, 2014 Springfield Cardinals activated SS Aledmys Diaz from the 7-day disabled list. April 29, 2014 Springfield Cardinals placed SS Aledmys Diaz on the 7-day disabled list. March 23, 2014 St. Louis Cardinals optioned SS Aledmys Diaz to Springfield Cardinals. March 9, 2014 St. Louis Cardinals signed free agent Aledmys Diaz. November 24, 2013 IF Aledmys Diaz assigned to Tomateros de Culiacan.